If you are celebrating success within your team or with clients treat them with a tasting devoted to Champagne and sparkling wine. The tasting can be run for small or large groups as a standalone event or before, during or after dinner. In teams, you'll taste 7 wines, comparing Champagne with other sparkling wines from around the world, including Italy and England. Some are made in exactly the same way as Champagne so will you be able to tell the difference? There's the option of quiz rounds and prizes to keep the event light-hearted but with an added competitive edge. Once you've sampled the different styles try your hand at making a Champagne cocktail! The tasting can be held at your offices or an off-site venue. Gold £40 + VAT per person, with a minimum of 10 guests. We taste 7 wines with 2 non-vintage Champagnes and 5 sparkling. Platinum £45 + VAT per person, with a minimum of 10 guests. We taste 7 wines with 1 vintage and 2 non-vintage Champagnes and 4 sparkling wines. 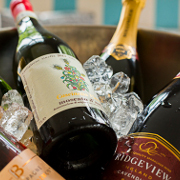 We can provide a Champagne or sparkling wine reception to greet your guests with a glass of bubbly as they arrive. This is ideal if guests are coming from different locations and likely to arrive at different times. If you wish to try a particular wine we can offer to upgrade any of the wines, for example to include Krug, Cristal or other Prestige Cuvée or vintage Champagnes. Please let us know and we will provide a quote to supply the wine. We can supply prizes of wine accessories or bottles of wine for the winning team. To find out about booking and request a quote contact us on 020 8288 0314 or email us. Jane and Chris, Just wanted to thank you both so much for making the champagne tasting event on Wednesday so successful. We received lots of positive comments and our guests clearly enjoyed the event. Many thanks to all of you at ThirtyFifty for making our event so memorable.